I’ve been known to have a weak spot for turtles. Yep, turtles. And, in particular, turtles attempting to cross the road. (Where the turtles are going is anybody’s guess. I suspect that will be one of those “Why God…” questions when we get to heaven). In the past, I’ve helped mostly box turtles but also an occasional snapping turtle or two, both in various sizes. The box turtles hiss and sometimes urinate on you as a defense when you attempt to help them not knowing that I have their best interests at heart. I’m not so generous with the snapping turtle though. I cherish my digits so I help them with a rather long stick. But, I digress. 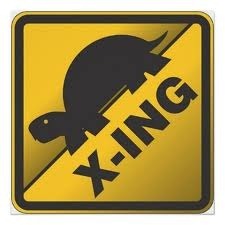 For whatever reason, while others fail to notice turtles waiting to cross the road, my eyes zero in on them. And sure enough, it happened twice just yesterday. The first time didn’t turn out so well. I saw the movement on the road just ahead and, as usual, stopped to help the little guy across the road. Much to my dismay, I noticed the right side of his shell broken and his insides exposed, the body beating rapidly to the pulse of his heart. Blood was coming out its’ mouth. It looked at me as if to ask for help. I kid you not. Seeing the cracked shell, the exposed little turtle body, and the blood coming from its’ mouth I figured it wasn’t going to make it. Within seconds, it turned to the side of the road and slowly crawled into the weeds. I doubt that it will survive. I know this really sounds corny but seeing this helpless, innocent little mangled and bloodied turtle really bothered me. I returned to my car, started the engine, and shifted into first. Before I got the car into second gear, the thought immediately struck me. “You are concerned about turtles. Are you equally concerned about the millions of people that perish each day without Jesus?” I felt convicted and slowly advanced through the gears, pondering what I had just experienced. Some distance passed and I wondered how I traveled so far without really being cognizant of it. Jonah runs from God and finds a place east of the city. He makes himself a shelter, sits in its shade and, with eager anticipation, can’t wait to see what will happen to this ungodly place. God graciously raises up a leafy plant up over Jonah to give him shade and ease his discomfort. Jonah is comforted and pleased but the next day God provides a worm which eats the plant. When the sun rises, God sends a scorching east wind and the sun blazes on Jonah’s head so much so that he grows faint. Jonah pouts and whining says it would have been better for him to die than to live. God, ever the teacher, asks Jonah, “Is it right for you to be angry about the plant?” Jonah surprisingly says yes. (I think maybe for the first time in my life I would have shut my mouth as this point!). Jonah responds and tells God that he is so angry he wishes he were dead. Then God goes for the jugular. Sound familiar? Should I, like God, not be more concerned for the billions of people of the world that are without Jesus than I am for turtles? I think so. 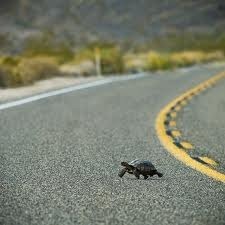 And, although I don’t need plants or scorching winds to learn that, an injured turtle is a good reminder. I will still help turtles cross the road. I just have to. But Anne and I will also remain committed to Bible translation just in case I have a tendency to forget.